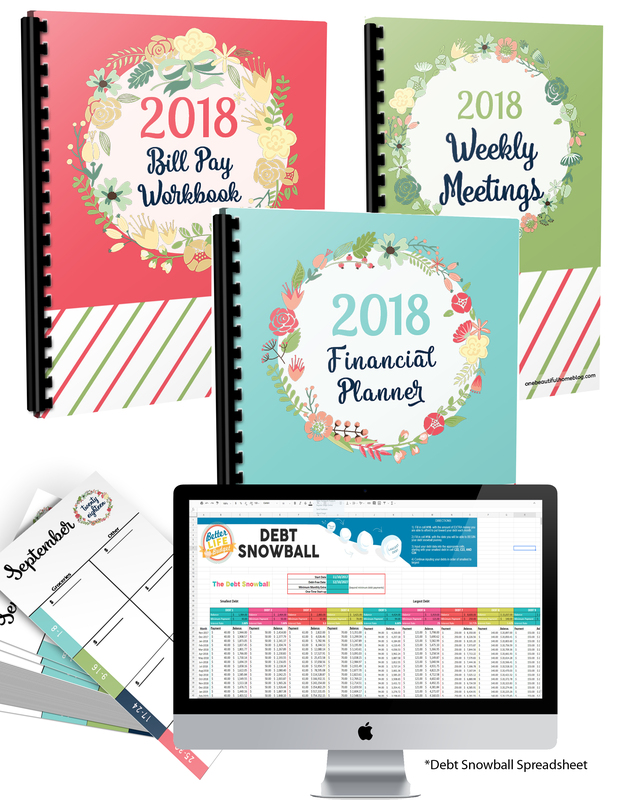 Last week when I launched the 2018 Financial Planner – I also told you that along with the planner bundle I was including my Debt Snowball Spreadsheet. 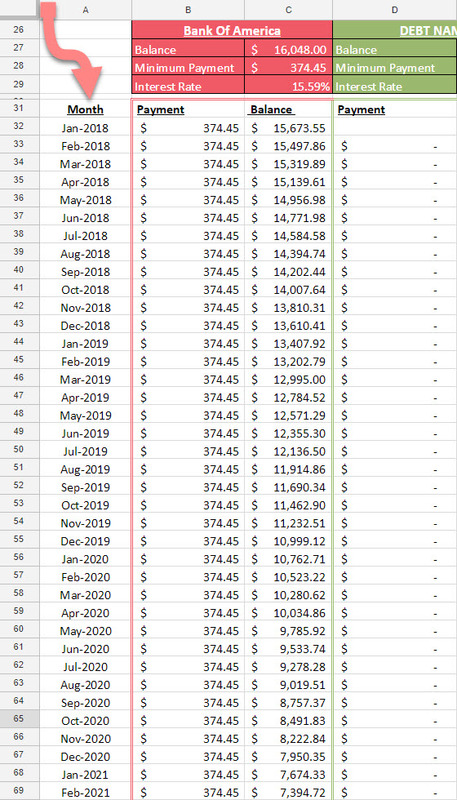 The spreadsheet I have been using for years – the tool that was the catalyst to lighting the fire under our butts to start paying off over 160,000 in debt (Student Loans)! Today I am excited to walk you through the Debt Snowball Spreadsheet. I am excited to show you how it works, and why anyone and everyone who wants to pay off their debts should be using it! Why is this spreadsheet so good? It is good because it lays it all out for you! It is one thing knowing that you have debt. You make your monthly payments, and not really think about it. You feel like you have “extra” after your bills are paid, so why bother? “Bother” because without this debt snowball spreadsheet you don’t realize that you will be paying off that 8,000 credit card balance (Making minimum payments) for the next 12 years! And, if we are honest with each other, you probably have more than one credit card, add on some student loans, a car payment and who knows what else. Those 12+ years is now actually 15, and you are throwing tens of thousands of dollars away in interest payments. PLUS – that is TWELVE years of your life, that you are making payments. That is 144 monthly payments that you had to make! You don’t realize how long it will take you to become debt free until you really sit down and plan it out. 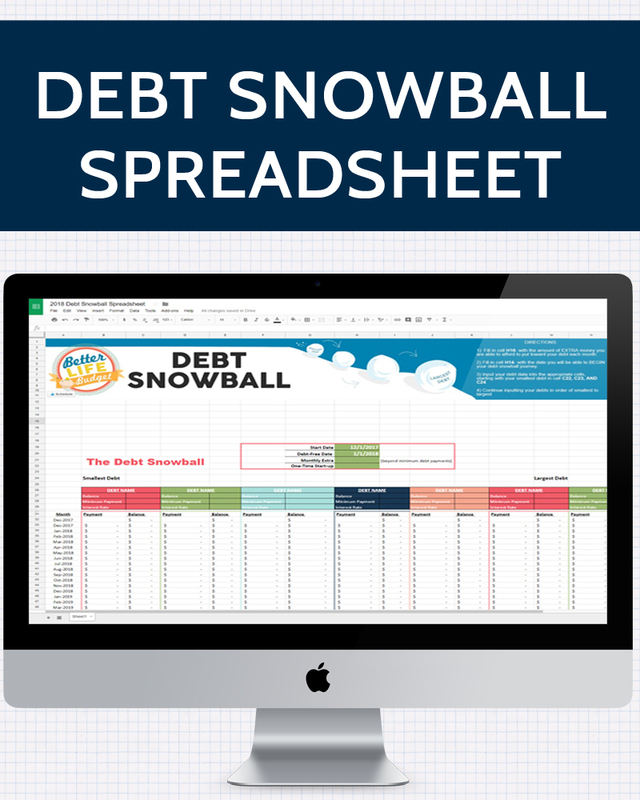 Before you start using the Debt Snowball Spreadsheet you need to know how much debt you have! You need to know your debt balances, interest rates, and minimum payments. 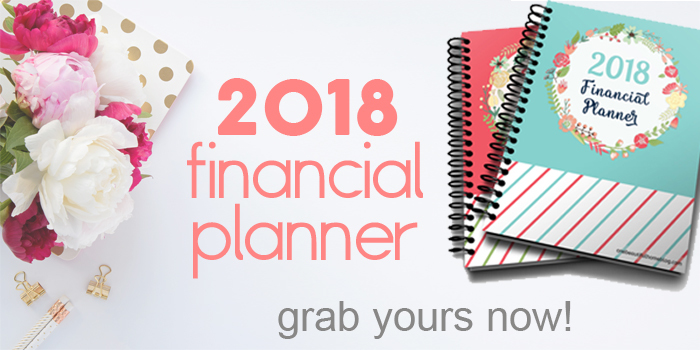 If you are using the 2018 Financial Planner! 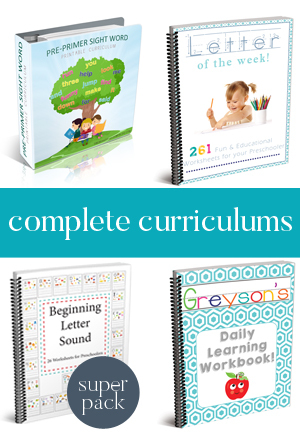 then you already have this information right at your fingertips! When you first open the debt snowball spreadsheet, the screen looks like what you see above. A pretty, color-coded screen just waiting for you to input your financial figures – so it can get to work crunching your numbers! Going down your debt priority list – fill out your financial information. Starting on the left side of the spreadsheet, and work your way to the right. For the purpose of this post, we are going to use the following numbers WHICH ARE BASED ON THE 2017 NATIONAL DEBT STATISTICS! As you fill in your numbers, the debt snowball spreadsheet automatically begins calculating how long it will take to pay off your debts. Just for this single Bank Of America credit card, it will take them over 5 years! Continue movings to the left, until ALL of your debts are entered into the sheet. When you open the debt snowball spreadsheet, The start date is entered as the first of the year. You can change this. The Monthly Extra and One-Time Start-up is blank. Debt Free Date- DO NOT CHANGE THIS. This box automatically calculates for you. This is the date that if you stick to your plan, and make your payments that you will become DEBT FREE! Monthly Extra- The amount of money that you can afford to add to your debt every month. One-Time Start-up- A single large or small payment at the beginning of your debt free journey. This is a lump sum that you apply to your 1st debt. Below is the difference in the debt-free date for the Bank of America Credit Card (in the example above), based on different Monthly Extra and Start-up scenarios. 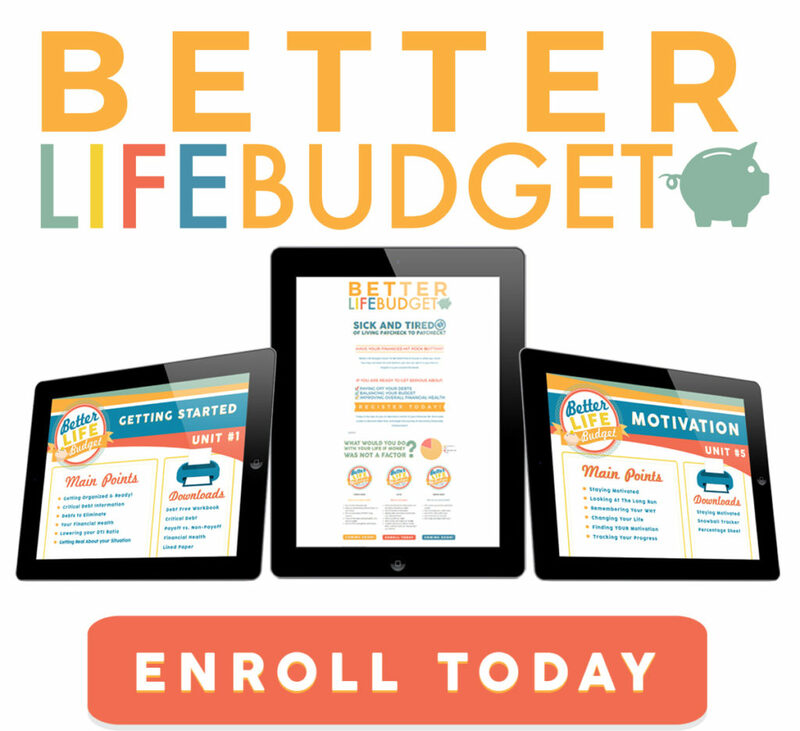 With $250 extra a month you can have the debt paid off in 2 years. 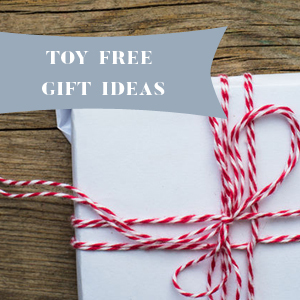 With $500 extra a month and a one-time start-up payment of 200, you can be debt free before Christmas 2019! 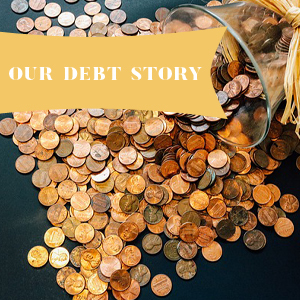 With $750.00 and a one-time startup of 500, you can be debt free by the spring of 2019! 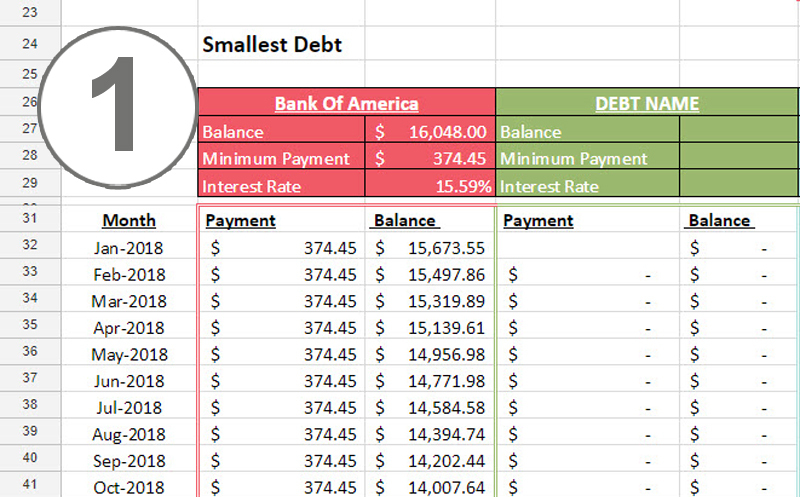 The best part of the debt snowball spreadsheet is that in an instant it shows you how quickly you can become debt free with some hard work and sacrifice. It is also very beneficial to see how much (or sometimes, how little) $25.00 a month can make. Sometimes that $25.00 is better suited being put towards your monthly grocery bill. – But really only you and your family can determine that. The Debt Snowball Spreadsheet just does the calculating for you. 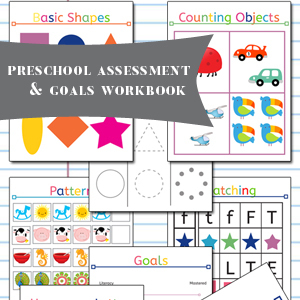 Step 3- Examine and stick to your plan! Now that you have all of your debts inserted into the debt snowball spreadsheet, you also put your Monthly Extra and Startup figures in. Work the plan. Make the payments! Try and make even larger payments. Every 4-6 months depending on how many times you made MORE than the extra monthly payment, start a new spreadsheet. I like to copy and paste the entire spreadsheet onto a second sheet (Within the same document) – and update your balances. With larger than planned monthly extra payments, your debt free date is going to get closer and closer. I like knowing the date, and trying to reach it earlier than anticipated! Along the left side of the spreadsheet you’ll see the dates (That is calculated based on your Start Date) – If you scroll down, you will be able to line up your debt free date for every single debt that you have. Set-up micro goals and challenges, to reach each debt free date and not just the Big date where everything is paid off. Don’t forget to celebrate every single one of your debts paid off. So now it is your chance. If you are ready to eliminate your debt and want a clear picture of when it can happen for you. 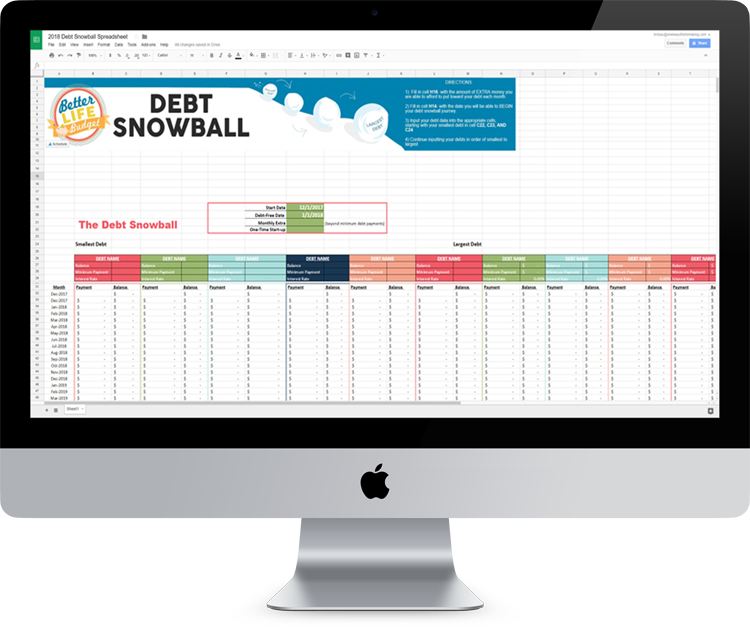 Grab your Debt Snowball Spreadsheet – OR Get the full bundle for just $15.00 and really kick your debt to the curb!